To answer all that ask "What are you doing"
" Where are you?" Please check out the website on this business card. 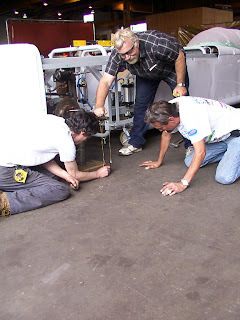 How to install a rear axle in a prototype aero car. 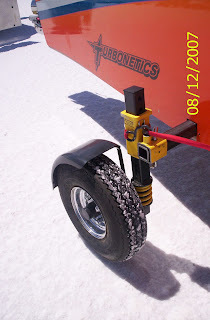 but the rear axle was perfectly and squarely located by Peter Dieseng. Pat Carlson,Werner Sprenger,Kevin Knox and Me. Once again the crew showed their tenacity and skill in performing tasks with no clear drawings! 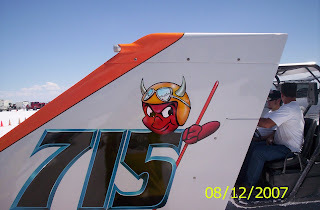 Landspeed Louise, " Canadians missed you"! 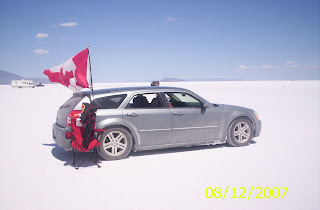 When it comes to land speed racing media persons, no one is more popular in Canada than Louise Ann Noeth, aka Landspeed Louise. Everywhere we went at the salt we were sharing the news that she was convalescing awaiting surgery in California. At last report she is recovering as expected and we hope she will be mobile and driving the "GHawk" when we get it to the salt. Wishing her a speedy return! We may have not witnessed very many exciting record runs this year but the Hot Rods were out in full force. Hundreds of fine examples of rat rod and rad rides. At the BBQ at the Bend in the Road we met these guys from Prairie Speed and Hop Up Magazine. 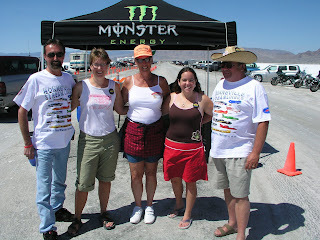 Earlier we had met Wendy from the Bonneville News and Pork Pie from England's Speed trials magazine . Speedweek is always a time to admire new creations and chat with friends, this year was no exception. 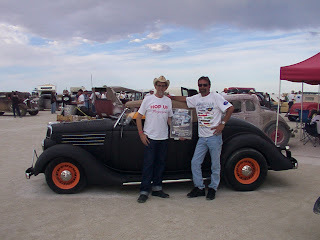 Werner and I got to spend some time with Mr Flatfire himself , Ron Main who was debuting his newest creation SPEED DEMON. 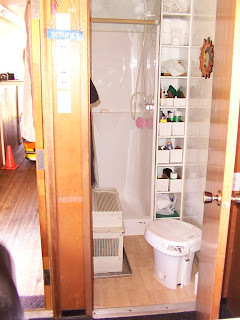 IT IS VERY WELL EXECUTED AND WE WERE ABLE TO STEAL A COUPLE OF IDEAS FOR THE GOLDENHAWK. 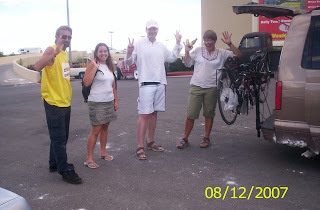 Sunday at Bonneville was delayed by wind for a while but the wind also blew in our greatest fans Alana & Robyn,(see their trip on the link to their blog) and We met them and Ray at the Nugget in Wendover to receive the bikes for transport back to Vancouver. Werner built a very good bike rack for the van to safely do the job. Good work Werner! Monday we introduced them to the Lands end crew and Linda as well as Wendover Visitors bureau manager Kerrie Supanich , showed them land speed racing and gave them a big Hug to send them on their way to hike in Zion Nat. Park. 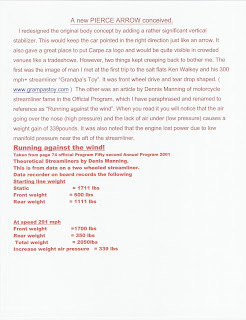 Well Speedweek59 (2007) Was and that is good. 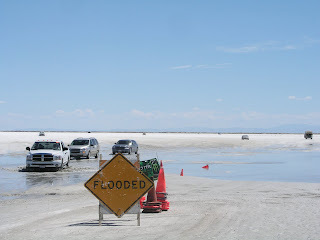 As you can see the rains dampened the road out to the salt but not the desire to get there. The longest line upin Wendover wasn't the Buffet or the hot rod show but the car wash! 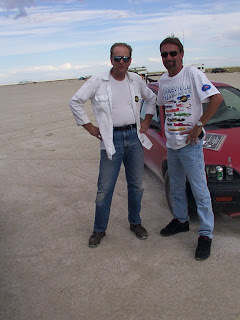 Werner and I drove from Vancouver to Wendover on Friday the 11 August, 14.5 hours is fairly easy with two rapid drivers and not many long stops. 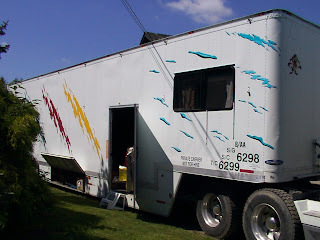 This is for sale by Bob owner of the KOKOMOTION and a prostock drag car. We are considering it but also looking at other trailers ,new and more pro finished. A classic,a collector, handmade, convert and hardtop, sports car, great suspension, tires and brakes, goes like a bat outta hell. My last convertible, the one I have always wanted since it came out, but the thrill of the 57 Pontiac convertible,over shadowed these other fine automobile, a 1965 Dodge Monaco convert, a 1966 Plymouth Sport Fury convert, an Austin Healy Sprite, and a 1970 Red M.G. It was like an infatuation of the first order! Do remember your first automotive love? 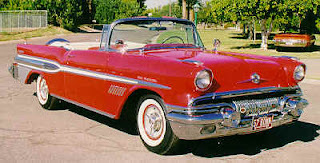 This was my first convertible, a '57 Pontiac. It was August 1964, the car was a bit rusted underneath, but it looked new and for a 21 year old RCAF photographer it was my dream car . 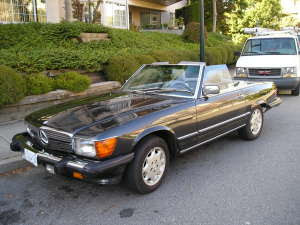 I paid $600.00 for it in Ottawa, the first day of my summer leave, put my bags in the trunk and I drove it, non stop, top down across Ontario, through Michigan,Wisconsin,Minnesota, North Dakota,stopping only for gas and coffee, to Newdale, Manitoba to visit my sister Gaylene and (bro'n'law) Glen. I had lived and gone to school there before joining the Airforce so it was party time. 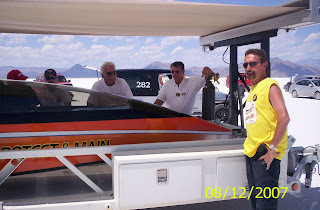 The car was aptly named, after the Animals' classic song "House of the Rising Sun" for it was many a dawning day that witnessed, my friend, Bob "Crow" Brown and yours truly returning from preserving the wild life. Those were the "Happy days!" Hawk has hatched but needs time to fledge. Alas there is not much to report about the progress of the build. It is that time when summer holidays and family activities dominate the time and minds of red blooded people. The same people who were passionate about building the streamliner in January, find themselves short of time to do the extra things they have on their to do lists. However some parts are being made for the rear end and hopefully next week Ben will be finished the overdrive. Kevin will take the car to Hydra Steer on the 15Th for the three day build of the steering shafts and the mounting of the steering wheel. I will go hunting for more sponsorship for safety equipment. I sure wish we were going to Speedweek to run the car but Werner and I plan to attend anyway. Question from guest to web site. 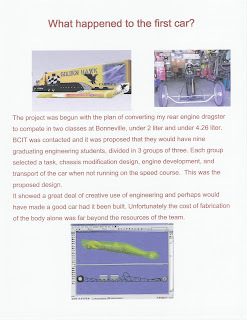 What happened to the first car you were building with the rear engine/ We thought it was pretty neat and we liked the 2 litre diesel engine concept. Was it a VW tdi? Yes, it was a tdi. For those who missed it and requested copies, I can only offer you this, it is the text without the photo of Werner, and Peter Diesing and Yuri Tofini of Aggressive Tube Bending. 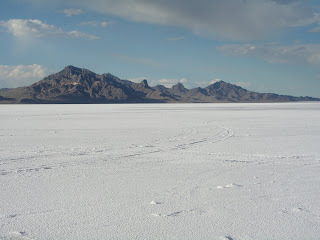 Five hundred kilometres an hour.That's how fast Randy Pierce could find himself hurtling down a racetrack in the Utah desert this summer, hoping to set the land speed record and guarantee Surrey a place in the record books. "It will be our first time out, so we're hoping to run the car somewhere over 200 miles an hour," Pierce said yesterday. "But the computer tells us we should be able to go 330 miles. "That's more than 500 km/h and a certain record for the makers of the Golden Hawk. 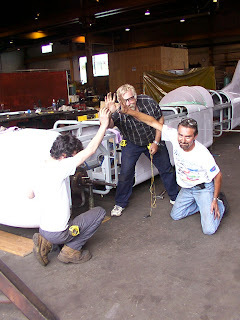 A crew of about 25 people, many of them from Surrey, have been working on the car at a Port Kells warehouse for more than a year.Pierce said the streamliner car is almost guaranteed to set a record at Speed Week, Aug. 11 to 17, on Utah's Bonneville Salt Flats, because there are no other vehicles in the same class. 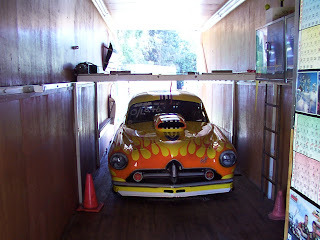 "It's a one-of-a-kind," he said.The four-wheeled, steel-framed Golden Hawk is powered by a four-cylinder, 3.9-litre diesel engine, with a turbocharger and nitrous-oxide injection.When it's complete, the car will be loaded on to a transport truck and driven to Utah, where it will be raced on a seven-mile course. 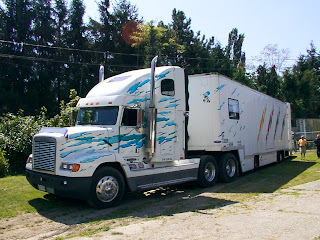 "We want to establish the record for the four-litre this year, and then come back next year and do better," said Pierce.A truck will push the car for the first mile until it reaches about 100 km/h. By the third mile, the car will be running on its own, and its speed will be measured over the next three miles. At the end of five miles, the car will be shut down and four disc brakes and two parachutes will slow it down.Pierce will be the car's first driver, followed by his next-door neighbour, mechanic Werner Sprenger.Pierce said he's not nervous about the ride. "[The car] is like an arrow. It wants to go straight, so it's really pretty safe," he said.Pierce said he's building the car for "bragging rights" and publicity for the automotive industry.A former public relations photographer and dragster racer, the 64-year-old Surrey man now owns www.carpe.ca (Agnew Bailiffs and Financial Adjusters Ltd.) a bailiff company. In 2003, he underwent heart surgery.Instead of slowing him down, the experience has given him the need for speed.The rest is history in the making. Thanks to gluymes@png.canwest.com for the story. I am trying to be most patient as I wait for parts to be made or modified. 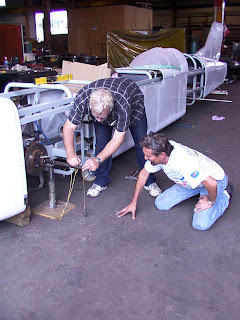 So far the cockpit/canopy is getting an interior liner by Kevin Knox and built by ATB to stabilize it . The rear wheel mounting system is almost ready to install. Aggressive Tube Bending again came to the rescue by donated the very high quality brass pump for the Front drive oiling system. Now I have to find a winch motor to drive it. 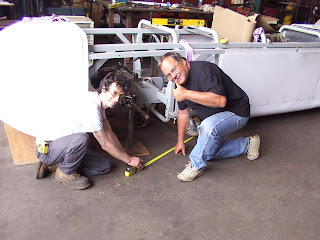 Paul Dukes at HydraSteer is waiting parts and will install the steering 15 August at their shop. Nick Boos the TOTAL CONTROL artist (airbrush genius). Ben at OTT INDUSTRIES says the overdrive will be ready next week end. (www.totalcontrolart.com ) is champing at the bit to get started. GOODYEAR HAS BEEN SILENT!! Sooooooooooooooooooooooooooooooooooo weeeeeeeeeeeee waaaaaaiiiiiiiiittttt.